Regina is the capital of the historical Saskatchewan region, the Canadian province bordering the US states of Montana and North Dakota. It's known for being the region's cultural and commercial hub. While not a celebrated tourist destination in itself, the city is the region's main transport hub and a common stop for travellers. Visitors spending a day or two in town will find a few interesting museums, good shopping opportunities, and some vast neighbourhood parks. 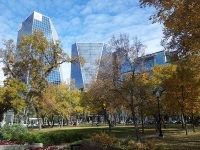 Regina may have more open space per person than any other Canadian city, making it a popular choice for outdoor enthusiasts interested in biking, cross-country skiing, and long walks. The Wascana Lake occupies the centre and is perfect for boating in summer and skating in winter. Regina is also known for its famed Wascana Centre, a park built around Wascana Lake. It's home to the Royal Saskatchewan Museum, the Regina Conservatory of Music, an art gallery, as well as the Saskatchewan Centre of Arts. The Cathedral Village has cafes, bookshops, and a few good restaurants. Visitors should also try the local dance, music and theatre scenes. We are looking for contributors for our Regina travel guide. If you are a local, a regular traveller to Regina or a travel professional with time to contribute and answer occasional forum questions, please contact us.